Back in 1873, the Sisters of Loretto in Santa Fe, New Mexico, hired workers to build a chapel on the grounds of the Loretto Academy, a women’s school they ran. The original architect of the chapel died during the construction process, and when the workers had completed the job, everyone soon realized the architect had made a big mistake. He did not include a way for people to ascend the twenty-some feet into the choir loft. They called in experts who all told them that the only way to get into the choir loft was a ladder…a traditional staircase would take up too much room. The Sisters prayed for a miracle…and they received a miracle! Did St. Joseph Himself Build a Staircase? With nowhere else to turn, the Sisters of Loretto prayed to St. Joseph, the patron saint of carpenters. On the ninth day of their prayers, a mysterious man appeared at the chapel with a donkey laden with carpentry tools. He offered to build the sisters a staircase. What he built was nothing short of a miracle. The mysterious carpenter constructed a unique double spiral staircase that was functional, beautiful, and so tightly turned that it didn’t eat up precious space in the chapel. The overjoyed sisters planned a celebratory dinner to thank the carpenter, but he disappeared as quickly as he came. The townspeople searched for him…even running a newspaper ad … but were never able to find him or learn his name. The Sisters of Loretto concluded that the master carpenter must have been St. Joseph himself. 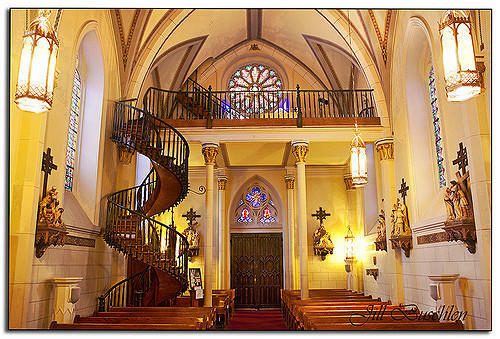 While spiral staircases were nothing new, the staircase at the Loretto Chapel is unique in its design. The steps spiral in two complete 360-degree turns which is extremely difficult to design and build without the aid of computers. Additionally, the staircase showed no visible signs of support, like a main support column. After a number of years, metal brackets were installed to connect the staircase to the wall to provide more support, but the original structure relied on the tightness of the turn radius for support. 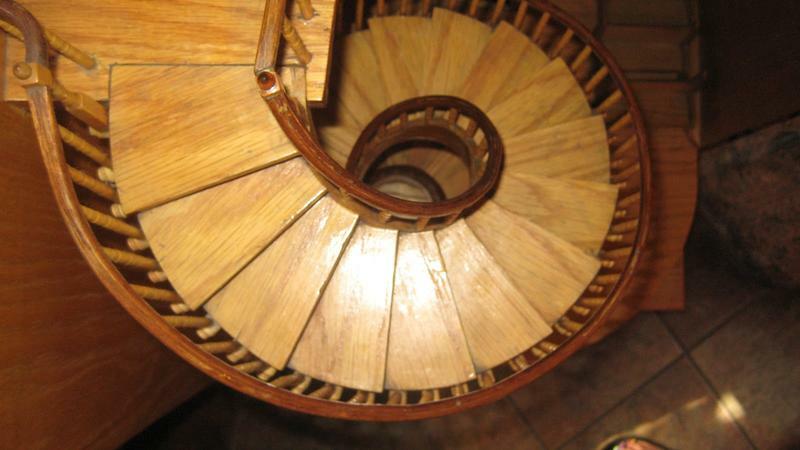 Lastly, the entire staircase was built without using a single nail. During the time that the staircase was built, nails could be hard to come by so carpenters used wooden pegs or other methods for securing wood. That was the case with the Loretto Staircase. Wooden pegs hold the structure together. 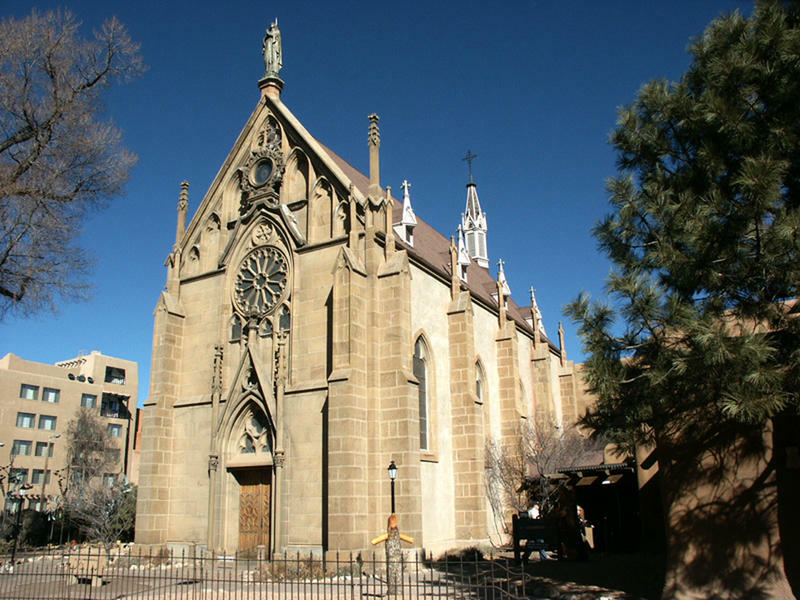 The mysterious carpenter left the Loretto Chapel before the Sisters could pay him for his work. When they went to the local lumber yard to pay the bill for the materials used in the construction of the staircase, they found that the lumber yard had not supplied the carpenter with the wood. No one knows where the wood came from or even what kind of wood it was. Later analysis determined that the staircase is made of spruce but it could not be determined which species of spruce it was. Was the Mysterious Carpenter’s Identity Discovered? An amateur researcher named Mary Jean Cook unearthed documents in the early 2000s that led her to believe that the mysterious carpenter was most likely Francois-Jean Rochas, also known as Frenchy, a hermit rancher and carpenter who settled in New Mexico from France. 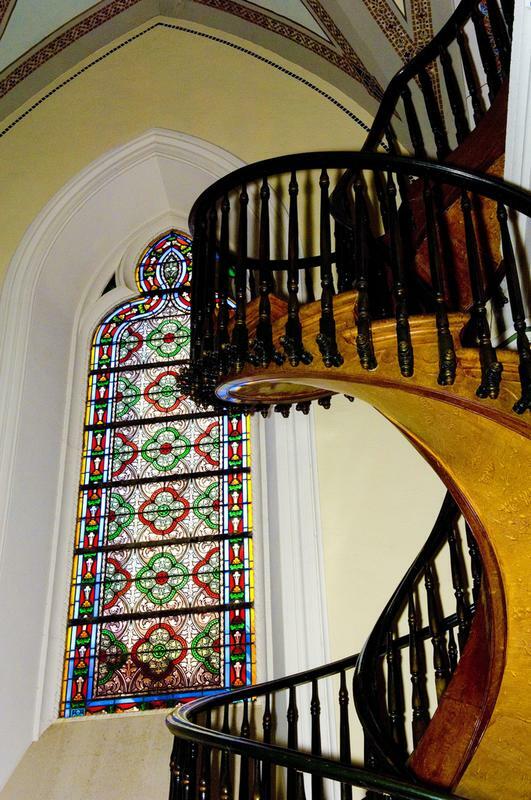 In Rochas obituary, which ran in the Santa Fe New Mexican newspaper in 1894, it was written that “he built the handsome staircase in the Loretto Chapel and at St. Vincent sanitarium”. Although he kept mostly to himself, Rochas was known throughout Santa Fe and had earned a reputation as a skilled carpenter. Although Rochas seems like a probable candidate, one question remains…why did no one identify him at the time of the construction or name him when the newspaper ad ran that asked the public for help identifying the carpenter? 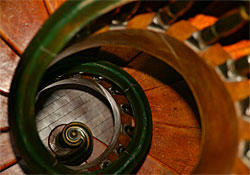 Today, the Loretto Chapel is a museum and visitor can view the magnificent and mysterious staircase. Due to safety concerns, the staircase is closed to visitors.